Ted Gaines got a CRA endorsement in 2012. CRA is a Conservative Grassroots organization. The CRA is Socially Conservative and Ted Gaines has always scored well. Until the author of prop 8 ran against Ted’s unqualified and proven to be incompetent wife for assembly. Nothing to see here, move along now, he says. This is the same mantra of the moderate Republicans that think we should stay away from social issues. Ted is entitled to his opinion – but lying to a Conservative Group to get its’ support is absurd. In addition, it is simply a case of a personal vendetta against the author of Prop 8 for running for assembly against his wife. This is consistent with the Gaines pattern. So much for Christian Values. Folks – State Mandates once again are forcing the “wasting” of the $500k. If you vote Democrat, thank you so much for screwing local government. Local government is no longer immune from the onslaught of state and federal mandates. Business has been reeling from them for years. Thanks in large part to (John) Allard the momentum has shifted staff and council efforts through collaborations with public associations to participate in rule making procedures and addressing proposed legislation. It is time consuming and risky but less so when private enterprise adds its political clout and political and technical expertise to the efforts. We have a law and regulation committee that us very active. And staff now understands how these gruesome proposals affect the bottom line of the publics’ budget. In essence the anti business legislature is pushing its dirty work down to us to do. And there are penalties if we don’t. Unfunded State Mandates with punitive penalties if City Governments don’t waste money. Under AB1890, AB2021 and SB1 – Public Utilities are REQUIRED to collect “Public Benefits Dollars” and spend them on an extremely limited array of “educational services”. What else would you expect from the idiots in Sacramento! Thank you to the anon letters’ sender for making sure that the source of this was identified. When I first heard that Spencer Short was at odds with the firefighter’s union, I thought he had seen the face of Jesus and become a Conservative. Mr. Short also got $1,000 as part of the nearly $35,000 he had to spend to defend his infestation of the Lincoln City Council from the Firefighter’s Union. I think the Union is regretting that decision. Spencer Short has been the poster child for the shuttered fire station in Lincoln. He has been there the longest on the council and the Station sits idle with a ladder truck worth nearly $1.5 million in it. So – he tried to jam a proposal through the council to open said fire station with 2 Firefighters per truck, not three. This would take the already minimal staff and spread them across more trucks. Imagine a three-man defensive line without a Nose Tackle. It gets better – apparently, there is actually money to hire more fire fighters. The proposal is to hire two firefighters or a battallion commander. The two are similar in cost. Logic says, if your fire service is on a skeleton crew – hire two dudes, and fast. Short wants a Batallion Commander so that fire station three can be re-opened with the two-men-per-truck option. Dear followers of Lincoln Professional Firefighters. We are here to let the people of Lincoln know that your Firefighters want only the best for you. There was a decision made by city council last night on changing our ways of staffing. They decided to go from 3 person engine companies to 2 person engine companies. They did this to open the McBean station. This idea was not brought to our attention to be discussed as a department and implemented without input from the people that are actually on the engines running the calls. We do not support this plan and do not support how this was brought upon us. This plan can compromise our safety and quality of service and care for you. We agree that the 3rd station needs to open, but it needs to be done right with staffing of 3 personnel. Our stance is two engines with 3 would be more effective than 3 stations with 2. We know this posting might create discussion, some agreeing, some not. Feel free to ask questions. If this turns into a heavy topic of discussion, we are willing to set a date to meet and greet our citizens to inform you facts and stats to educate you on how exactly an engine company works. Thank you for your time. Wow, Spencer Short can’t win for losing, he’s wrong again. Some have roundly criticized me for refusing to drink the Beth Gaines Kool-Aid. Republican Assemblywoman Beth Gaines of Rocklin got more than she bargained for when she wrote an amendment this week to a budget trailer bill on mental health services. Gaines asked that the word “underserved” be changed to “undeserved” in language that calls for a program designed to prevent mental illness from becoming severe and disabling. The program in Senate Bill 77 would emphasize improving timely access to services for underserved populations. Democratic lawmakers huddled on the Assembly floor for several minutes Friday before they broke to ambush Gaines in a floor debate. They voted to prevent her from discussing other amendments she proposed to the mental health bill, but asked her to read the portion on the one-word change. Then the Democrats took turns voicing their objections. Republicans came to Gaines’ defense, arguing that the language was a bill-drafting error. Speaker John A. Pérez of Los Angeles disagreed, pointing out that Gaines initially stood behind the amendment when forced to read it on the floor. Gaines ultimately asked members to vote against her amendment. Lawmakers obliged. Thank you for reminding me why I worked for Andy Pugno. And the rest of you should thank Charles Munger and Republican leadership for pouring nearly $1million in to keeping her in office. CA-25 Update: Why Did Buck McKeon Staffers Endorse a Nazi for School Board??? Here is the link to the original Blog in santaclarita.com website. Yes, a Nazi. THAT kind of a Nazi. In this link you will see that the State CRA endorsed Stephen Winkler for Saugus School Board (in the Santa Clarita Area). It quotes then CRA VP Bob Haueter who was also Buck McKeon’s Chief of Staff at the time. Bob Haueter and the Buck McKeon Staff helped found the RAGSCV, a rival unit to the Santa Clarita Valley Republican Assembly. You might be wondering with two clubs in the area how one got their way and the other did not. Both RAGSCV and SCVRA endorsed in those races in 2011. Stephen Winkler wrote a letter to the editor complaining about how Republican Groups did not endorse him! When the conflict arose, CRA President Celeste Greig instead of forcing them to meet together for a local endorsing convention (What the CRA By-Laws say to do) decided to recognize the endorsements of the Buck McKeon CRA Group RAGSCV and invalidate those of the SCVRA. Whoops. 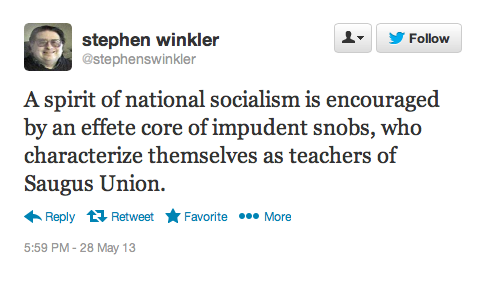 Stephen Winkler has apparently manifest his insanity for all to see since being elected. Stephen Winkler is a Nazi – and has been making Nazi comments on the internet for years – so anyone that did any vetting would have known. The article is a sick, disgusting treasure trove of nazi and vile bigoted comments made by Winkler and was written by someone in an obvious attempt to embarrass CRA and the Republican Party. Please note that Winkler has switched parties a ton of times. Some of Winkler’s thoughts and insights? Buck McKeon should issue an immediate apology to CRA and to all the living survivors of the holocaust and fire any staffers that were a part of this endorsement. You have got to be kidding me Buck McKeon.